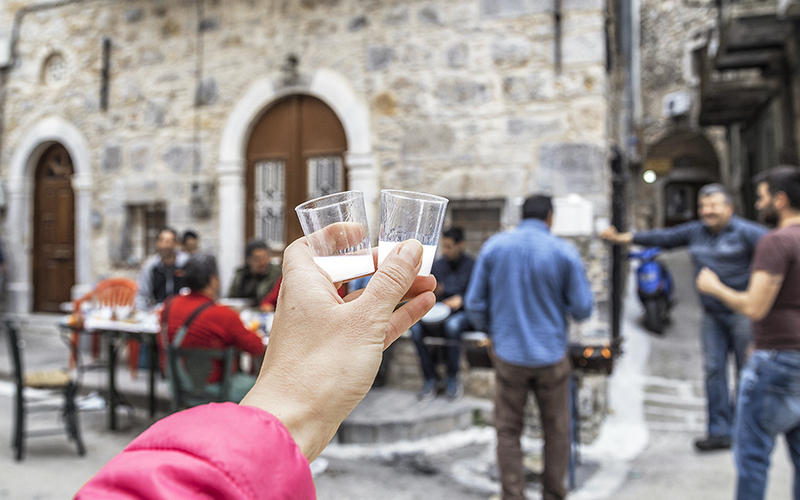 You’d think that mastic from the northern Aegean island of Chios would be an acquired taste. Its pine-scented, cedar-like essence, bitter and brittle at first, before being softened with the release of herbal resin isn’t quite for all palates. And yet, mastic liqueur is successfully making its way into British pub culture thanks to the efforts of George Economides, an Oxford chemistry graduate from Chios. For him, it’s all a matter of chemistry and he’s asking Londoners to join in by using Mastiha World liqueur as a base for cocktails and win a trip to Chios in the process where they can witness mastic production first-hand. The mastic harvest is a laborious process that involves cleaning and soil leveling so that the resin can be easily gathered from the ground. 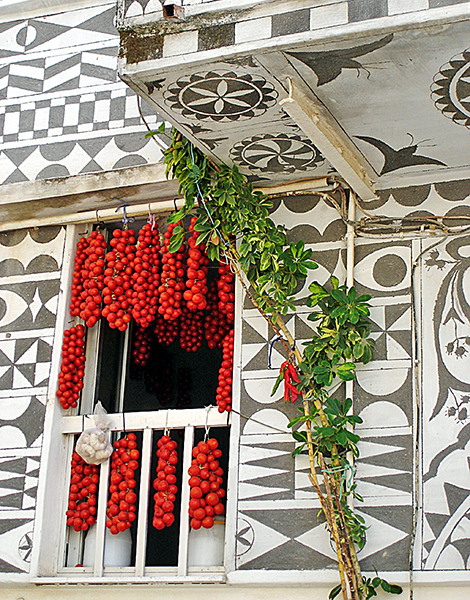 As a child, Athens-based Economides would visit the rolling hills surrounding the charming geometrically-decorated Mastihohoria villages every summer to help out his “giagia” (grandmother) obtain the mastiha teardrop resin. It was a hard process, a “family affair”. They would cut the trunk in specific places to allow the resin to flow. 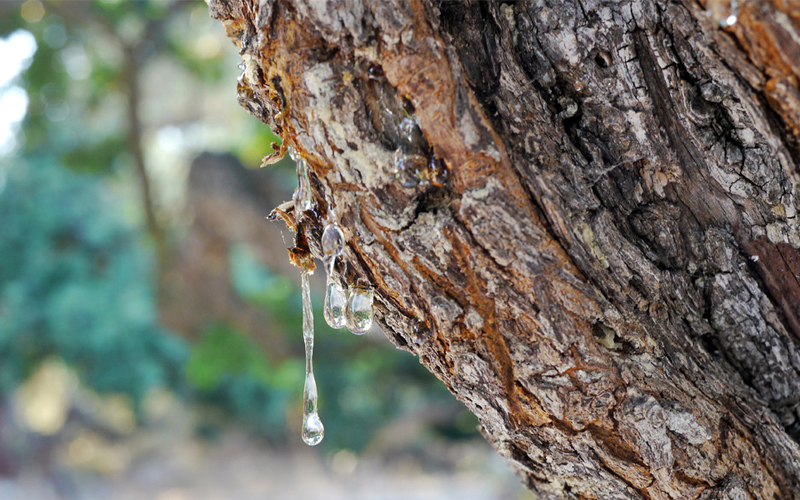 The locals refer to these mastic drops as “tears that please, perfume, relieve and heal”. Intrigued by their properties, Economides received his while discovering the aromatic and therapeutic qualities of the Chios Protected Designation of Origin (PDO) product. “I guess mastic was always at the back of my mind due to my deep love for Chios, even while I was studying chemistry,” he says. During his annual summer pilgrimage to his family’s island, he’d bring his new-found Oxford friends along to experience for themselves the deep-rooted tradition in the cultivation of the unique product that only grows on the southern part of Chios. “Awestruck by the process, they would pack their luggage with mastic products. Entire suitcases!” he says, adding that even after the thrill of the vacation had faded, they would place orders for more. Leaving Teddy Hall, Oxford, with a first-class degree in Chemistry, a doctorate in quantum mechanics and a full Oxford Blue in Dancesport, Economides was offered a well-paid consultancy job as the first rung on the ladder of what could have been a promising career. The offer coincided with a stag party on Chios at a time when Greece was still suffering from a crippling economic crisis. The rest is history, Mastiha World Ltd, was established as a startup of young Greek expats to the UK and graduate students in August 2014 through the import of Kentos (20% proof) and Enosis (30% proof) mastiha liqueurs. “We wanted to promote mastic by scouting out the premium authentic spirits of the Chios Mastiha Growers’ Association,” he says. The risk of turning down a lucrative job offer for the chance of endorsing a product he knows well and believes in has paid off. Mastiha World is going from strength to strength, having won five awards in its first year and taking England by storm as it appears in a growing number of top cocktail bars and restaurants around the country. It is already featured on the cocktail list at London’s prestigious The Ivy while it’s become a firm favorite at Raoul’s and the Lighthouse in Oxford. From your average Londoner to chef Gordon Ramsey, mastic liqueur has become the talk of the town. Having passed its first tests with flying colors, versatile mastic will come back with more products for Brits to sample. The sky’s the limit with mastic that can be enjoyed as gum, food additive, cosmetic, sweet and therapeutic medicine used since antiquity to cure all manner of ailments. On his part, Economides is reaping the rewards of his labor while sitting at his oak Oxford desk at Little Clarendon Street, cloudy skies outside, made sweeter with the taste of mastic – and home! 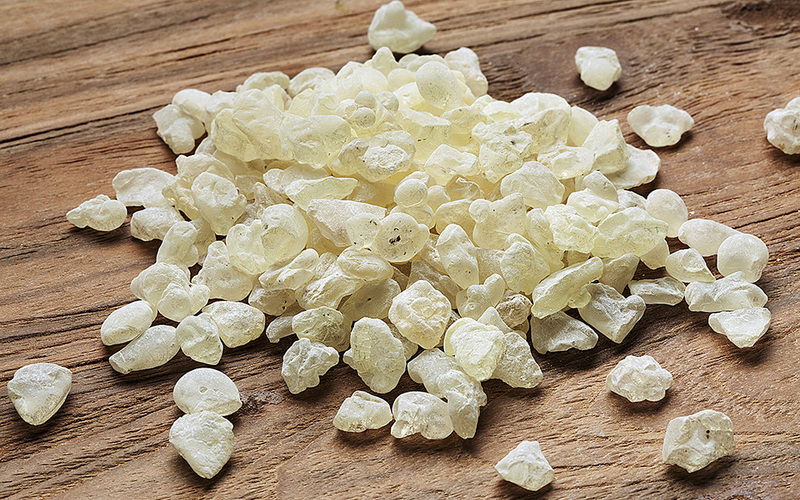 The most unexpected place where I’ve found mastic… it has to be in Morocco, when we were told that mastiha tears were used as a traditional wedding gift at a city next to the Sahara desert! People there kept the tears as a treasured item. 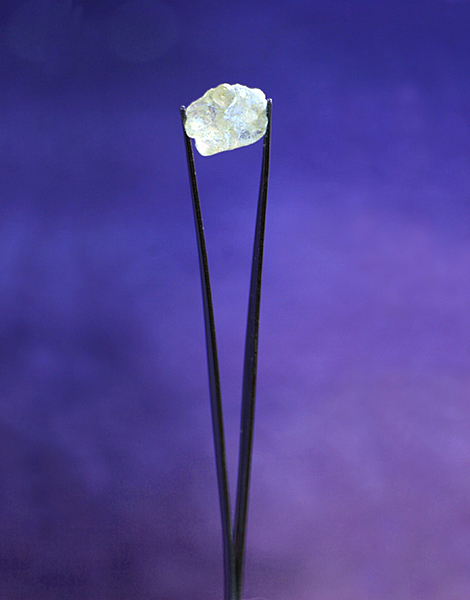 We saw mastiha tears kept for over 20 years. An interesting use of mastic…At a restaurant we recently experimented with pouring mastiha over pork belly or duck on a wok. The Enosis mastiha liqueur caught fire making a flambe coating of mastiha-flavored caramel over the meat. Delicious! 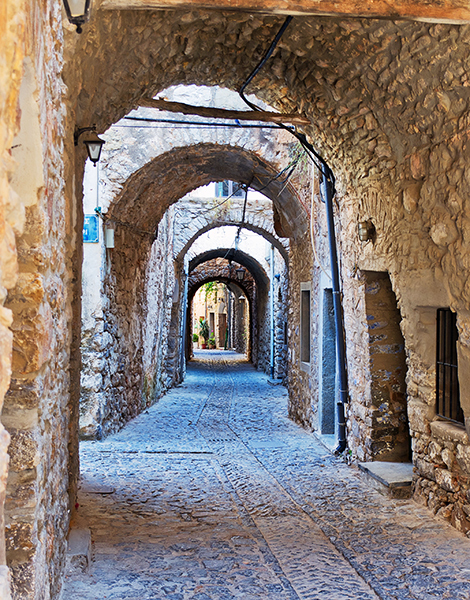 My favorite place on the isle of Chios… It has to be the awe-inspiring architecture of Pyrgi, which is truly a world treasure. Otherwise, underneath a mastiha tree or at Oz for, what else but Enosis cocktails of course. Something modern Greece can teach the world today…I think the Greek people can definitely be taken as an example of resilience. After years of recession, hard measures and corruption, I see more and more Greek entrepreneurs that are ambitious, motivated and ready to make a difference for themselves and their country. A lesson for Greece…We should learn that what we sell is an experience, not products. While Greek products are outstanding, very few of them are supported by proper marketing and without a budget or a clear strategy the market penetration will be limited. Rate Greece vs. England…Both are beautiful in very different ways: it is like asking one to compare an English castle to a Greek village by the sea. I count myself lucky to have lived in both. What I miss most from Greece…My friends, family and the sea. When I first moved to the UK, it used to really upset me that I could not see the sea from anywhere in Oxford. If I knew then, what I know now… Things would have been easier – but then again that was half the fun! Death of a Hero is a special one. 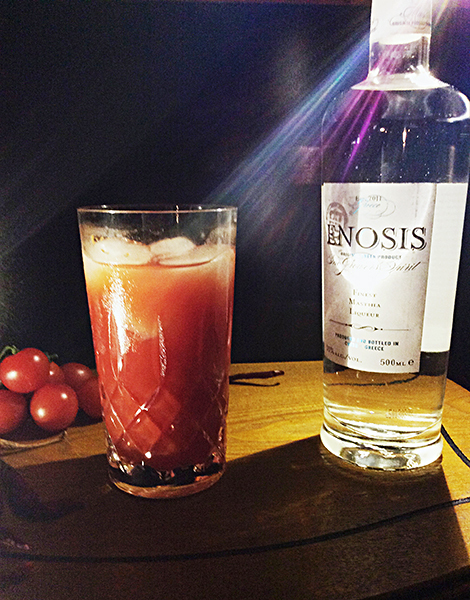 It is an Enosis mastiha Bloody Mary to celebrate 103 years from the annexation of Chios to Greece and dedicated to the people who fought and fell for that to happen. Shake in a cocktail mixer and serve in a big wine glass on ice. Garnish with dehydrated citrus and an extra grind of black pepper.